Alabama has had five capitals since it became part of the United States. 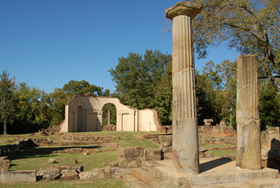 During the territorial period, the town of St. Stephens (in what is now Washington County) served as the capital of the Alabama Territory, beginning in 1817. When Alabama achieved statehood in 1819, the capital shifted to Huntsville for the first state constitutional convention, and the next year, after much lobbying by political factions, the capital was moved to Cahawba, Dallas County. As the power centers in the state began to shift, political factions began to push for a new site, and in 1826, the state legislature voted to move the capital Tuscaloosa, where it remained until 1846, when the centrally located Montgomery was selected as the permanent state capital.